So, the two Challenges are the Color Throwdown #112 (sept. 28th) and the diva sketch challenge [(sketch) sept. 18th]. 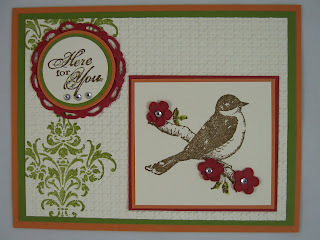 My Stampalicious Card Club has a sketch challenge this month, and I selected the UDI website. I wanted my group to have 'samples' using Stampin' Up! products. The rules to our card challenges are simple: use the sketch/color combo, and SU! products. For our challenges, I don't have the club members make a card for every member, instead, they make one and we vote on whose we like best. I do this, because I would rather encourage their creative side, instead of having them 'dumb down' their entry due to cost, or mass produce-ability. The winner gets to select from the 'prize box'. 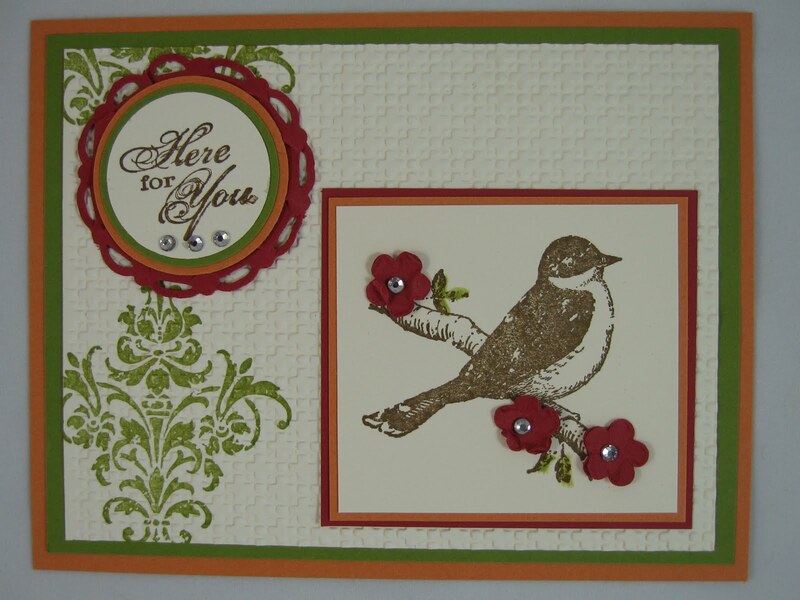 Back to my entry: I wanted to use just one stamp set and the colors for the challenge. I wanted to show that you can create a beautiful card without spending a million dollars on product. Don't get me wrong, I am more than happy to sell you a million dollars in SU! product, so please contact me to place your order. cardstock: old olive, pumpkin pie, riding hood red, and vanilla (neutral). Thank you for looking, and please post a comment: let me know if you like my card, or if you think its too plain. And don't forget to post a comment on the 'Halloween Candy' entry and follow the guidelines to win some blog candy. Very pretty---I haven't used that set for a while, I need to "dust" it off! Thanks for playing with the CTD this week! Very pretty! I love the design! Thanks for playing in the Color Throwdown with us!